This photo appeared with Mr. Gustafson's cautions in 1939. Concrete grain elevators offered more to the local farmers’ cooperatives than greater storage capacity: the risk of fire was vastly reduced, too. 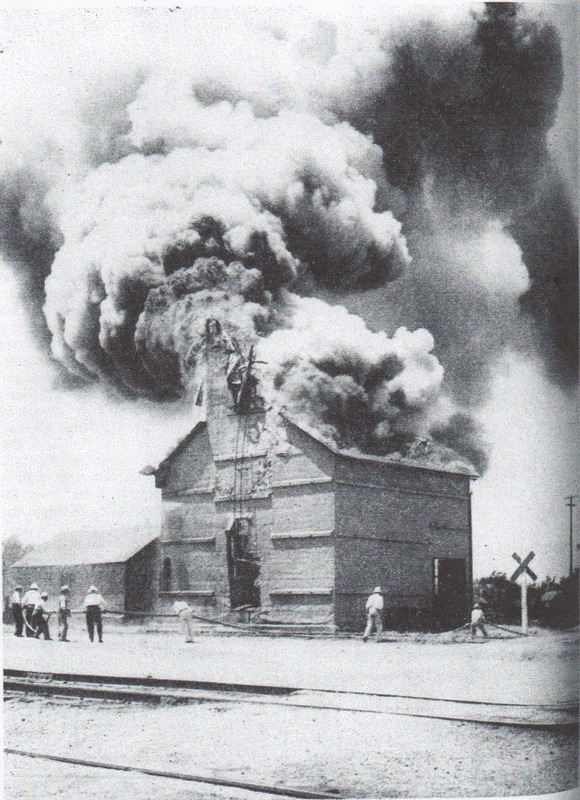 Several of the construction notices on this blog, for instance, one about the new elevator in Wapello, Iowa, point out that the new slip-formed elevator was replacing a wooden one destroyed by fire. A 1957 press photo available on eBay for $15, which is beyond our budget, shows the smoldering ruins of a wooden elevator beside an unscathed concrete one. Mr. Gustafson’s list started with the advice that bearings in the elevator head and conveyor belts should be oiled daily in order not to overheat. “It is not sufficient to simply ‘slop’ oil on the bearing, but the oiler should make certain that the oil actually reaches the interior where it will do some good,” he wrote. Bad housekeeping: neatness improves safety. Overworked electric motors: they should be cleaned weekly with compressed air, Mr. Gustafson wrote, and if blown fuses are a problem, a “competent electrician” should be called in if available. Elevator legs: check that the head pulley is operating smoothly and the belt isn’t rubbing against the legging. The following passage deserves to be delivered whole. Request the driver to shut off the motor of his truck. Considerable oil and gasoline is usually spilled in the driveway, particularly from gravity feed truck engines and ignition of this accumulation by sparks from exhaust or backfire would result in a fire difficult to extinguish. Signs calling attention to this rule are available from your Mill Mutual insurance office. Nowadays, we don’t notice trucks leaking as much fuel as in 1939. Mr. Gustafson’s practical advice concluded with the suggestion that the elevator operator return in the evening after supper to look in the cupola and basement to see that all is well. “Many fires are detected by observing this rule,” he wrote. Pulling the switches on lighting and power circuits when leaving was a final recommendation. This entry was posted in The Danger, Their Work and tagged architecture, Business, construction, eBay, Farmers, fire prevention, grain elevator, slip-formed concrete.